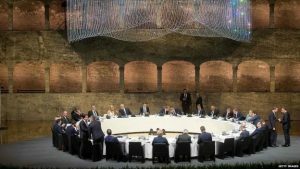 Leaders of European countries have warned time is running out for a Brexit deal ahead of more talks in Salzburg. There is still no agreement on issues including how to avoid new checks on the Northern Irish border. At the EU summit on Wednesday evening Mrs May stressed her “serious” proposals for future co-operation would ensure a “shared closed relationship”. European Commission chief Jean-Claude Juncker described her 10-minute presentation as “interesting”. “It was polite, it was not aggressive, she was doing her job,” he told reporters as he arrived for a second day of talks. Speaking to BBC Radio 4’s Today programme, two of the EU leaders said they hoped the UK would hold another referendum on Brexit, in the hope of reversing the 2016 result. Andrej Babis, the Czech Republic’s prime minister, added he hoped the British people might change their minds. But Mrs May said there was no question of the UK seeking to extend its EU membership. The UK is due to leave the EU on 29 March 2019, and both sides are trying to reach a deal in time, with a crunch summit specially convened in mid-November. Before the leaders gathered for the second day of the summit, Mrs May held talks with Irish Prime Minister Leo Varadka, who said “time is running short” to reach a deal. Later on Thursday the other 27 EU leaders are expected to discuss Brexit in Mrs May’s absence, focusing on the differences over the Irish border and how detailed a “political declaration” for future relations needs to be. As he arrived at the summit, French President Emmanuel Macron stressed the EU’s “very clear principles” about preserving the “integrity” of its single market, something that Mr Muscat described as a “big fat red line”. Mrs May’s proposal for the UK to sign up to a common rule book for trade in goods and a combined customs territory with the EU is unpopular with many in her own party, who believe it will erode British sovereignty and is not what people voted for when they backed Brexit in the 2016 referendum. And later former Brexit secretary David Davis is expected to label the proposals agreed by ministers at Chequers in July as a “non-starter”. The post Brexit: EU leaders warn time is running out for a deal appeared first on Citi Newsroom.